Do you ever look at someone and wonder what's going on inside their head? Well we do! We were super excited to watch the hilarious Disney-Pixar’s Inside Out at home. The movie is on Blu-ray 3D, Blu-ray Combo Pack and On-Demand. Inside Out will take the whole family on an exciting journey into the mind to find the answers. We love how the movie portrayed the mind. It is a wonderful way for children to understand what goes on in their mind such as how core memories are important for our personality, about long-term memories, our subconscious that helps us to be good, how important sleeping and dreams are, our train of thought, how some memories get deleted, imaginary island, and many more wonderful things that happen in our mind. I would sum it up as a child friendly psychology lesson. I love how the movie showed that it is important for us to feel all the emotions because emotions make us healthy and human! The story is set in the Headquarters which is the control center of 11-year-old Riley’s mind, where the five emotions are hard at work. The five emotions are led by lighthearted optimist Joy, who strives to make sure Riley stays happy as she operates alongside fellow emotions Fear, Anger, Disgust, and Sadness. 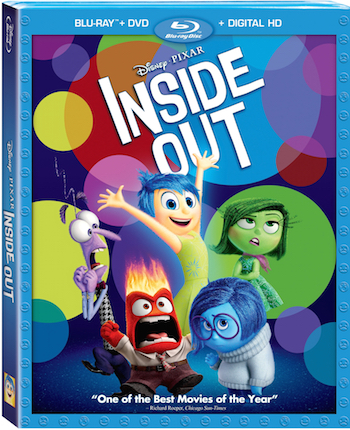 I like how this movie has a different perspective that makes us see ourselves from the "inside out". When they showed what goes on in the mind of the mom, dad, teacher, a dog, a cat, and more, we found it hilarious because it is true to many of us. We also enjoyed watching the bonus features including deleted scenes, about the actors, how the movie was made, "Paths to Pixar: The Women of Inside Out," and many more. We really enjoyed the fabulous theatrical short film LAVA and the animated short "Riley’s First Date?" It was really funny! 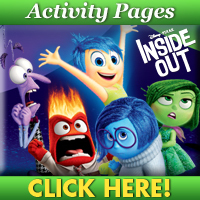 Check out the clip of Disney-Pixar’s Inside Out In-Home Trailer Featuring "Riley’s First Date". By clicking on the image below you can download some fun activities to do with your little one. This is a great movie. My kids love it! This sounds like a great movie -both fun and educational. It will really give kids something to think about. This movie definitely looks a little different from the rest. We haven't seen it yet, but probably will sometime soon. I'd like to watch the movie with my grandson. I would like to watch the movie with my grandson. We loved this movie and the kids are always requesting it for movie night. This movie is on the top of the kids Christmas list as they loved it in theatres! We have yet to watch this one....perhaps over the holidays! I haven't seen this movie yet, surprised my daughter hasn't mentioned it. We haven't seen Inside Out yet but we are hoping to have a movie night with friends tomorrow evening and that's the one we'll be watching if it works out! This looks like such a fun movie and I can't wait to see it, I feel like I'm the only one that hasn't seen it yet!! I can't wait to see this one! Looks so cute!